The development of town Hajdúszoboszló was stimulated by the wonderful medicinal water found 86 years ago by the searching activity of geologist dr. Ferenc Pávai Vajna. During the past eight decades our spa became world famous. With the significant developments of the last years, we have been making serious efforts to raise our facilities on European niveau, we can even give the sick people their joy for life back, futhermore: we can provide unforgottable relaxation for more and more families in our spa and entertaining water centre. We hope that providing quality services on European standards we will be able to receive any nation's visitors, and serve as good example in the society of Hungary's legendary spas. Hajdúszoboszló thermal bath is open continuously from 7.00 – 19.00 all the year round. There are 3 indoor pools and 4 outdoor pools with attractional services what are available for guests. You can get more than 40 kinds of treatment based on our controlled and qualified thermal water under medical supervision. lies on a wonderfully landscaped 30 hectare and is open from 1st May until 30th September. Each of our 13 pools are very popular, every generation can find their own favourite one from the different experience pools, swimming, wave pool, bubble pool and children’s pools. The sensation of the spa is the mediterranian beach lined by palm trees and sandy beach. A beach volleyball field, a beach football ground, streetball, footballtennis- and tennis courts are available for guests who wants to do sport in the spa. 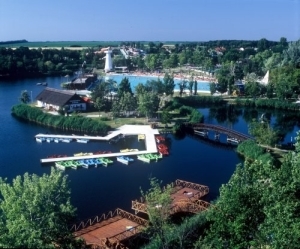 The Aquapark, Hungary’s first water-.slide park opened in 2000, is also located within the premises of the water park. 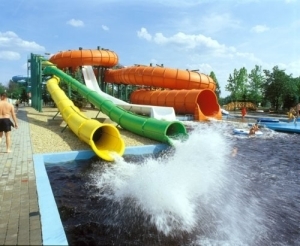 From the launch platform a tan altitude of 12 meters, lovers of the „big splash” can choose from 9 different slides. The combined length of the very popular thrill slides is more then one kilometer! The little ones are amazed by several mini slides, real-size elephants standing int he pools, a water castle with spouts and a playground of wooden toys. For those in search of more relaxed aquatic experiences, we recommend the drifting river. 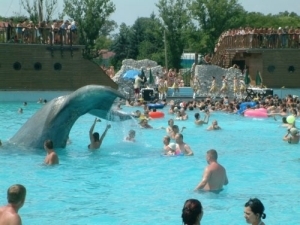 Access to the Aquapark is from the area of the water park, with a special ticket. 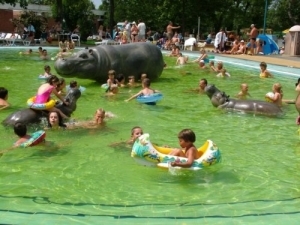 The training pools located alongside is ideal for families with children and for those still learning to swim. Other services: sauna, solarium, fitness center. The management does its best to make the traditional bathing even more enjoyable with colourful programs. The program days are more or less of constant character, so many of the guests adjust their holiday to these events.1st May promises a pleasant walk and entertainment for local inhabitants and guests when the spa opens its gates.